The nerve of any Leftist turd criticizing Trump University is incredulous. 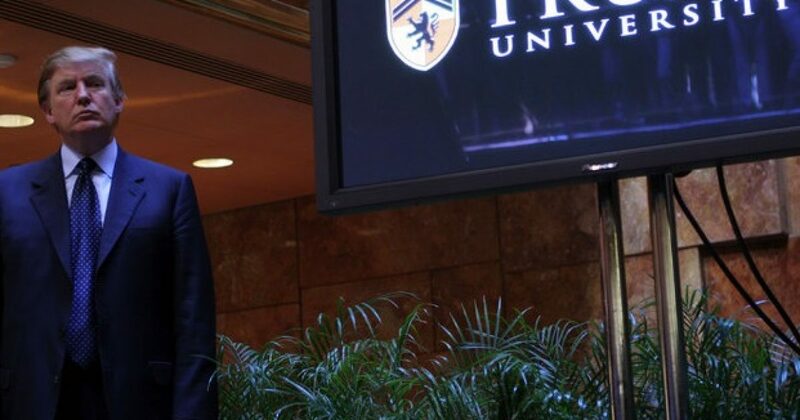 First, Trump University is not a university in the classic sense; it’s a real-estate school. And like the many others like it, it has lots of people who fail. They don’t fail because of the curriculum, they fail because they are failures. Trump U has a lot of successes as well. Regardless of what you think of Trump University, one thing is for sure; colleges and universities in America are far worse. America’s education system is a Ponzi schemes for the most part. Truth be told, the sports programs and STEM classes pay for all the nonsense degrees, like Ethnic Studies, Art History, Philosophy, and so o. These majors should have long been abandoned. How colleges charge hundreds of thousands of dollars for degrees that nobody wants or uses is what should be investigated. Hell, we all want to be bad artists, but some of us know that to make a living we need to get real degrees, like engineering, computer science, accounting, and so on. The education system has added more and more idiotic degrees in order to feed the ruse of education. Nobody has even questioned academia, when it comes to what is added and why. We just buck up and pay for this BS. College in America is a total fraud, and the Department of Education makes Trump U look like a convent. This media attack on Trump will backfire, because as with all things Trump, he ends up making people take a look at the real problem. I would love to see colleges and universities get held to the standard they want to set for Trump University. Let’s peel back the onion and look see where the real fraud is occurring. Kimberly Phillips Smith Oh! And I have 2 useless degrees. My BA in psychology was secured way back when I was young and unaware of marketable skills. I cleaned homes at about $20 an hour for the last 25 years. I went back to school for a paralegal degree…marketable skills the college said would fetch 70 grand a year. I left my little cleaning business and city for $12/hr with prospects of making good money in a few years. All lies. Nothing overrides experience. I never made more money than the years I cleaned and now I do pet sitting. That entrepreneurial spirit really is the key to success and stability. Lee Walker Honestly, if a person needs a babysitter before they go to any kind of school recruitment lecture, then they shouldn’t go at all! They are ADULTS! They made a CHOICE! They didn’t do their due diligence! NOTHING any different that the hundreds of thousands of kids that get federal dollars to go to no-account schools and colleges in this country–including phony online seminaries! Ray Villanueva I think the reason these overeducated “tards” live in their basements is because their parents make them live down there to save themselves the embarrassment of having to look at what they brought into this world and these geriatric kids refuae to go away. What American colleges and universities should be called is Fed U, and that can be shortened to F U, since that’s what’s happening to students and taxpayers.